I love this!!! Definitely reminds me of the 80's, but more of the graffiti, lol. I need try this one day. But based on your description, I must do it when I have time. Looks amazingly good! I hear you on the cleanup! WOW!!! this just looks amazing !!! I love it!!!! Awesome! Love the color combination!! I will have to try another splatter mani. I attempted one and it didn't do anything. Would it maybe help to use some oil on your cuticles AFTER the basecolor but before splattering? Might be easier to scrub off :). Or that liquid paste stuff you can stick to your cuticles! Anyway, love this manicure, looks very disco ;). wow! That looks amazing! Have to try this! I love these!!!! I usually tape off my nails like if I were watermarbling before I splatter to help with cleanup. I am so madly in love with your color combo! I love these so much, the colors you picked together are just perfect! I LOVE it! The color combo is awesome! I love the 80's splatter! These are really great colors! 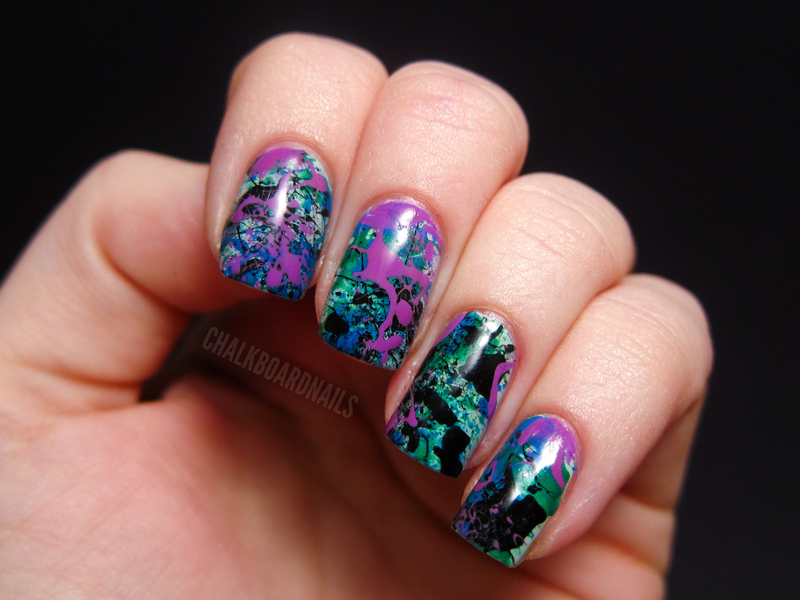 Maybe the most gorgeous splatter manicure ever! I love this.. You're so talented!! Holy WOW! This is just simply amazing! WOW. 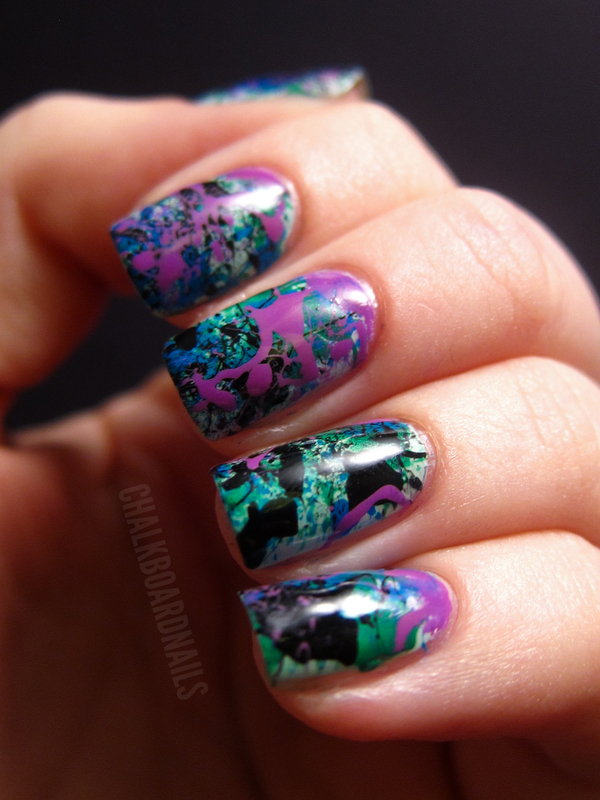 Very artsy and tricky mani you created. This looks great, I'll have to try it! Amazing. Love the colour combo =) I must try this technique one day. Does it splatter further than your fingers? @Becca - Yes, it does splatter everywhere. That's why I tape up the finger surrounding the nails; that way you can peel off part of the mess. Even so, you will probably need a Qtip dipped in remover to clean up the fingers, too. Heroes in a half shell! TURTLE POWER! My little brother was in Love with TMNT. Funky splatter nails my friend. I love them! i liked ! i love this mani! i will try this mani!! Holy Crap these are awesome! I love the colors you picked!! I can only imagine how hard the cleanup must have been! These are super neat and the color combo is perfection. Love it! 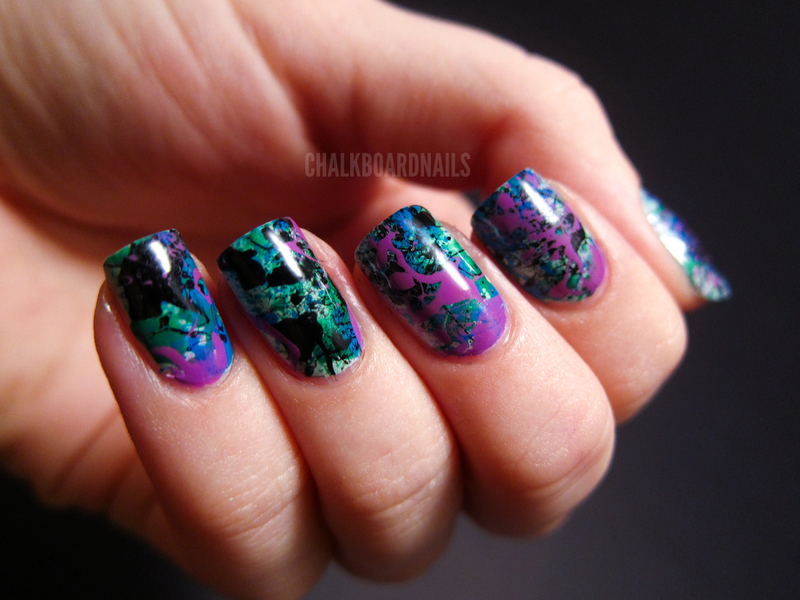 Love it, I have yet to try this mani, but I really should.. I love this "darker" type of mani. I will certainly try this in the future! 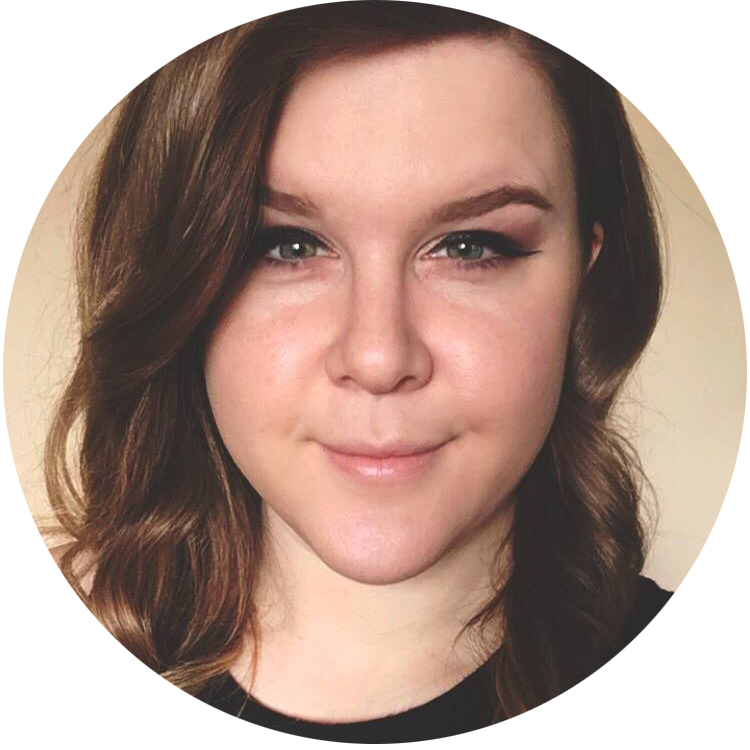 Hi, I'm new to your blog and I love it!! Your manis are so impeccable - how on earth do you get the cuticles so neat? Every time I've tried to use a Q-tip or small makeup brush at the base of my nails for cleanup, I just end up smearing the polish around rather than creating a neat edge. I'd love for my polish to look as neat and tidy as yours. This is just AMAZING!!! I LOVE your blog! What a talent u have!! (So glad ur mom gave u a "shout out"!!!!!) I can't wait to see what u post next!! so this is amazing...i decided to try it because of this post...sadly mine didn't turn out even half as good as yours. you're amazing! i love how u did urs & the color combo! I loved them!! They are difficult to do, don't they?